Even though May is only supposed to bring flowers, so far, this month has been just as rainy as its predecessor. Given the forecast for the next several days, and at the request of some of our Twitter friends (ahem…. @Shawn_Rusich), we’ve decided to give you some pointers to help you brush up your umbrella etiquette. Obviously, the biggest grievances when it comes to umbrellas occur on the sidewalk. As we’ve mentioned before, proper sidewalk etiquette is crucial when living in the city, and this becomes quite apparent when it’s raining. People with poor umbrella etiquette really grind our gears. 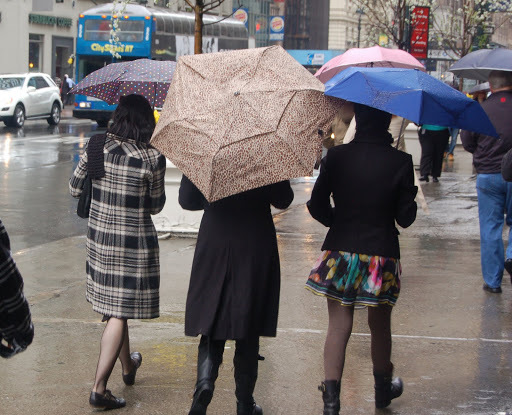 When passing someone on the sidewalk with your umbrella open, you need to have some sense of spatial relations. 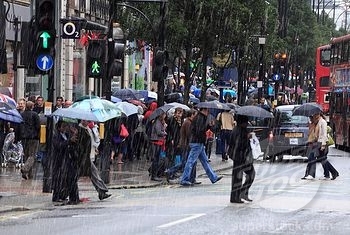 Just because you aren’t bumping into someone next to you doesn’t mean your umbrella isn’t. Obviously, avoid swatting your passing neighbour in the head with your umbrella. Be courteous, and lift yours as you go by. Of course, if that person is much taller than you, you should let them lift theirs first to avoid poking them in the face. Or, tip yours to the side, away from them. Nothing is worse than a prickly, wet umbrella in the eye. This is not the way to pass people with an umbrella in hand. When racing to get indoors out of the rain, you must close your umbrella just before you go through the door. Don’t bring an open, dripping umbrella inside. Other people coming in behind you will be equally eager to get inside, so chop chop – close that brolly quickly and hustle inside. Once you are inside, take care to not leave a dangerous, dripping wet trail of water all over the floor. Leave your umbrella at the front door, ideally in handy umbrella stand. If you are hosting and it’s raining, invest in said handy umbrella stand. Your guests (and floors) will thank you. 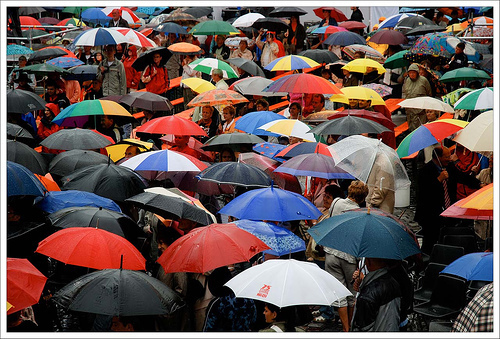 When choosing an umbrella, pick something fun and cheery. Why contribute to the dreary rain with a boring black umbrella? Plaid, polka dot, striped, bright yellow, or printed with palm leaves – if your umbrella is fun, maybe your fellow brolly carriers will forgive your other (worse) umbrella transgressions. And, finally, if you can’t follow any of the above etiquette tips, perhaps it’s best you leave the umbrella at home and invest in a good rain jacket. Embrace the wet and stop annoying people. Any umbrella etiquette tips that we missed? Tweet us @rockitpromo.